Voting for the third phase was also held in Leh and Kargil districts of the Ladakh region in addition to Ganderbal, Badgam, Kupwara, Baramulla and Bandipora in Kashmir. Voting in the third phase of Panchayat polls ended peacefully in Jammu and Kashmir on Saturday amid tight security. Polling was held in Ramban, Kishtwar, Doda, Kathua, Udhampur, Rajouri and Poonch districts of the Jammu division. Voting for the third phase was also held in Leh and Kargil districts of the Ladakh region in addition to Ganderbal, Badgam, Kupwara, Baramulla and Bandipora in the Valley. 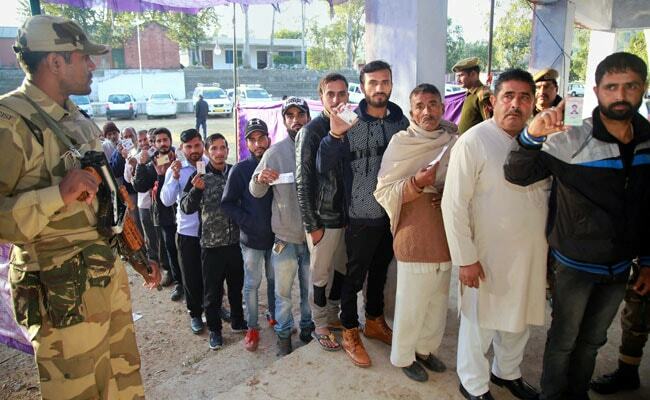 The overall voter turnout in the Jammu division was around 83 per cent, with 85.2 per cent voters turning out in Ramban and Kishtwar districts to exercise their franchise. In the Ladakh region, 75.6 per cent voters cast their votes in Kargil district while 64.1 per cent voters did so in Leh district. The overall voter turnout was 55 per cent in the Valley, where Kupwara registered the highest turnout of 59 per cent and Ganderbal the lowest at 12 per cent. The state saw a 75.3 per cent overall voter turnout on Saturday. Held amid tight security, polling ended peacefully with no reports of violence. The voting took place in 2,773 polling stations -- 918 in Kashmir division and 1,855 in Jammu. Polling started at 8 am and ended at 2 pm. According to the state's Chief Electoral Officer (CEO) Shaleen Kabra, 727 polling stations had been categorized as hypersensitive -- 493 in Kashmir and 234 in Jammu. He said 5,239 candidates were in the fray for 358 Sarpanch and 1,652 Panch seats, while 96 Sarpanches and 1,437 Panches have already been elected unopposed in this phase. "Photo Voter Slips had been distributed among the voters to inform them of their polling station," the CEO said. Mr Kabra said that in the first phase of the Panchayat polls held on November 17, 74.1 per cent turnout was recorded. In the second phase that took place on November 20, an overall 71.1 per cent polling was witnessed. The last phase of the 9-phase Panchayat polls is scheduled on December 11.